Shireen Ebadi the Noble Peace Prize winner(On 2003) is being threatened with death ! She spoke about receiving a threatening letter and announced that she would act on this letter immediately. In speaking with ILNA's reporter she announced : " Today a letter was delivered by post to my office, the letter had a forged address, and someone as a woman threthened me to death and have announced that there is a list with the names of 3,470 people and my name is also included in the list and that soon I would be punished for my deed ". She said : " I have recieved similar letter in the past and this shows that some people are intending by creating fear to prevent the activities of human rights defenders in Iran , for this reason, i would like to tell to all those people who have recieved this letter , no to become intimidated and not to slow their activities , because the gole of these letters are to intimidate the human rights defenders". She said : "After returning from a Hiroshima peace conference in Japan i would immediately follow the letter legally . Although I know there would be no result by pursuing the letter legally but as a lawyer I feel it is a duty to bring this situation to the attention of judiciary authorities and their duty to protect its citizens , the most important duty of every government is to protect the security ". It is needed to say that; A few days ago nine Noble Peace Prize winners in a statement criticized the government of Iran about the threat on the life of Shireen Ebadi and their opposition on the formation of the " Association of Human Rights Defenders ". Women's action and police forces reaction ! A million signature for changing the discriminatory laws ! This was the title of a seminar which was supposed to be held on Sunday Aug. 27 /2006 in a location in Tehran but the police forces by calling the manager of the place have forced him to cancel the gathering . This seminar was organized by the activists from women movement. The police force's reason for cancelling this seminar was claimed as to be the non existance of permission for gathering, but the women organizers said; according to the law and bylaws of the country for seminars there is no need to get permission.
" A million signature for changing the discriminatory laws " is a campaign with goals , mission and programs to fight back discriminatory laws against women.It was planned that madame Shirin Ebadi The Noble Peace Prize Winner , Dr. Naser Zarafshan Lawyer and a founder of the Association of Human Rights Defenders ,Ms. Moniru Ravanipour( writer ) , Ms. Shala Lahiji the publisher and ..... will speak in the seminar. This seminar was the continuation of women's protest gathering in " Haft Tir Circle " which was attacked by the women police agents and as a result many were arrested and wounded including madame Simin Behbehani the " Lady poet of Iran " . At around 5:00pm several personalities who were supposed to speak joined the gathering but later Ms. Nushin Ahmadi Khorasani one of the activist from women movement announced that the seminar is being cancelled and told that the campaign is a long term struggle . while in there several women activists started collecting signature for this campaign, this continued for fourty minutes and then they left the place . It is needed to say that the police forces allowed the activists to stay at the location and tell to their colleagues that the seminar has been cancelled. The organizers at the end of the gathering distributed a statement saying : Iran is a society which women are more educated than men and more than 65% of the university students are girls....... and the existing laws are way behind the culture and situation of the Iranian women. The statement critically looked into the discrimintory laws against women and demanded these laws to be replaced immediately . Another student is arrested ! According to a news recieved from " Alameh Tabatabaie" University , Mr. Abolfazl Jahandar a student of this university and a blogger , three days ago have been arrested by the security-information agents . According to the news coming from " Students Committee in Defense of Political Prisoners " there are no news on his where about and on what charges he was arrested but the students are worried about his situation since the security agents and their organizations are active in making scenarios for many students in the past . Mr. Abolfazl Jahandar was in charge of the site of "Puya News" and formerly he was a central council member of the "Association of Islamic Students" of ATU and member of the council of " Daftar Tahkim Vahdat" ( another student organization). Iranian women have been arrested in numbers after the revolution, both on political grounds as well on issues related to press freedom. Many of the families of political prisoners have been subject to such stress and have endured harsh conditions as a result of unspeakable pressures on them. Iranian women have been arrested in numbers after the revolution, both on political grounds as well on issues related to press freedom. Many of the families of political prisoners have been subject to such stress and have endured harsh conditions as a result of unspeakable pressures on them. The extent of the pressure endured by women whose husbands or brothers faced detention and torture, and who themselves have been subject to the same fate, is mind-boggling. Today, with the introduction of new press laws concerning journalists, these pressures have escalated to a higher level. Many of these journalists or their associates have been called in by the intelligence and military apparatus of the Islamic Republic. The most notable of these laws are the current law which prohibits any criticism against the Islamic Republic as an act against national security. This law, clearly states that anyone who criticizes the regime will be prosecuted to the utmost. The article states that: “Anyone who criticizes the Islamic Republic or helps the opponents of the regime will be subject to one month to a year imprisonment.” Mrs. Saghi Bagheri-Nia, the editor of the prohibited Asia Journal, is one of the recent victims of this law. In addition to her, Mrs. Negar Eskandar Far, the editor of the newspaper Karnameh (report card), is another woman facing similar charges; her case has been referred to the high courts. The common assumption is that prison is prison whether those in it are men or women. However, even in prison, the legal situation of women is quite different from that of their male counterparts as they are subjugated to discrimination; among these women, those who are mothers face even more hurdles. Women prisoners who are highly educated face even more obstacles and their prison terms are harsher as they are scrutinized much more than other women prisoners. These women and the ones who are editors of newspapers or journals face incredible conditions and they are not allowed to share cells with their colleagues. Mrs. Sagher Bagheri-Nia, a pathology doctor, might be confronted with imprisonment; others like her, including Mrs. Eskandar who also might be incarcerated, is another good example. The emphasis on the discrimination against women prisoners and especially those who are highly educated is quite noteworthy, as there is only one section of prison which is allocated to women whereas men face totally different and more favorable conditions.Therefore, under such conditions and in the current state of affairs, it is best for the presiding judge to fine women of such stature rather than incarcerating them if and when they are guilty of the presumed charges. A report by "Students Committe in Defense of Political Prisoners" . The situation of more than 20 political prisoners in the province of " Azarbayejan" is not known! - Several others are still in prisons . According to the news unit of "Student Committee in Defense of Political Prisoners" what is coming below is the names of several other political prisoners in different city's of Azarbayejan who have been arrested during the protest rallies different Azarbayejan citiy's. Most of these individuals were beaten and are held in the prisons with harsh condition . Mr. Abbas Lesani, Mr. Behrouz Alizadeh, Mr. Alireza Yousefi, Mr. Hosain Balazadeh, Mr. Rahim Taraghi, Mr. Reza Tadayon , Mr. Bakhshali Rouhibakhsh, Mr. Aghil Azardokht, Mr. Rahim Rezaie and Mr. Hayat Hassanpour . Mr. Samand Ali Mohammadi, Mr. Younes Aghayan , Mr. Abadollah Ghasemzadeh and Mr. Mehdi Ghasemzadeh . No news on Ahmad Batebi's hunger strike ! According to " ISNA" : Mr. Bahramian the lawyer for Mr. Ahmad Batebi hope that his client be transfered from cell number 209 in Evin prison to a public cell. He said : " The wife of Ahmad Batebi in a telephone conversation have told me that she visited her husband three days ago and Mr. Batebi have asked her not to reveal anything have been exchanged in the meeting , and she is worried about Batebi's health ". 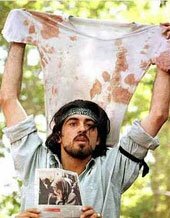 Ahmad Batebi is one of the student who have raised a bloodied t-shirt of a fellow student during a student protest in Tehran in 1999, His picture was published first in " The Economist" magazin, Mr. Batebi is 28 years old and married , After arrest in that students protest he was sentenced first to death but later the sentence was reduced to 15 years imprisonment ,he is charged with " Threat to the national security " , since his imprisonment he have spent 17 months in solitary confinement. Help save the lives of political prisoners in Iran ! Brown out in the internet of the country by a politically black out government ! According to the site of " Baztab " after sometime disconnection and then connection in internet , since last night almost 80% of the internet in the country is disconnected therefore only 20% of internet users in the country are able to use the internet. The Iranian officials blame Turkey and Emarat( UAE) for this problem.The official said : "Because we dont have support system therefore it is natural to have this kind of problem". This situation brought a crisis in the internet of the country. The official added : " Ministry of communication must find out who is to blame for this problem". In Iran there are more than 7 million internet users and more than 700 thousands bloggers who are active in reporting and writing. Ahmadinejad government is the number one enemy of freedom of expression , independent media, journalists and of course bloggers. To add to this news is the new crack down on the satelite by the order of government again in Tehran and other citys . Ahmad Batebi on his 22nd days of hunger strike in Evin prison ! Help save the lives of all political prisoners including Ahmad Batebi , Naser Zarafshan, Ramin Jahanbegloo , Tabarzadi, Mana Neyestani , Manuchehr Mohammadi ! One of UN demand in dealing with Islamic Repulic could become the release of all political prisoners in Iran . Ahmad Batebi on his 20th days of hunger strike in Evin prison ! He is suffering from multiple physical and mental disorder . The Simon Wiesenthal Centre's Director for International Relations, Dr. Shimon Samuels, addressed an "Open Letter to Norway" in response to the 5 August op ed in the Oslo daily, Aftenposten, by the author, Jostein Gaarder, entitled "God's Chosen People." An English translation of Gaarder's article follows Samuels' letter . Jostein Gaarder, the author of the literary chef d'oeuvre, "Sophie's World," has become seriously ill, either with malice or, perhaps, Alzheimer's, or both. Translated into 53 languages and with 26 million copies sold, so many of his readers will mourn Gaarder's current loss of vision, coherence and, above all, his recruitment to the forces of darkness. His 5 August article in your newspaper has exposed his shallow Biblical knowledge and the Judeophobic paranoia that haunts his nightmares. We call on the Norwegian people to decry his message. Obsessed with the Jews as "God's Chosen People," Gaarder regurgitates this concept's classic antisemitic definition as "arrogant and domineering." I recall from my childhood the ditty: "How odd of God to choose the Jews" and the refrain, "It's no so odd the Jews chose God." This self-assertiveness is indeed disturbing to tyrants - as a voice for freedom, diversity and conscience - the Jew, as witness, has been a "light unto the nations" throughout the ages. Not by claiming an absolute truth, but as a significant or early warning system for, what begins with the Jews is often a barometer for the human condition. When others see not the light, as in 1933 with Hitlerism, or currently with fanatical Jihadist terrorism, the scourge will bring us all to the abyss. The antisemite believes that salvation will come by effacing that Jewish light. For Gaarder, the "Good Samaritan" is not a "Pharisee" (codeword for Jew), but a "Palestinian", just as, for orthers, Hizbollah terrorism is posited as integral to the Lebanese political spectrum. Gaarder goes where no contemporary antisemite has gone before: "Without defence, without skin ... If the entire Israeli nation should fall and part of the population must flee to another Diaspora, then we say: may their surroundings stay calm and show them mercy. It is an eternal crime to lay hand on refugees and a Stateless people. Peace and free passage for the evacuating, civilian population no longer protected by a State. Shoot not at the fugitives! Take not aim at them! They are vulnerable now -- like snails without shells! ... Give the Israeli refugees shelter; give them milk and honey!" Gaarger yearns to extinguish the light of Jewish sovereignty and for the eternal wandering Jew to live once again at European sufferance - this time given "milk and honey" on the death march. Norway surely seeks not complicity in this "Gotterdamerung" revival. Gaarder claims that "Israelis ... cheered the plagues of the Lord as 'fitting punishment' for the people of Egypt." He knows nothing of Jewish liturgy. Daily our prayers recall in sorrow the Red Sea drowning of Pharaoh's horde, which was in pursuit of the Israelite refugees, bent on slaying them. We also mourn the Lebanese victims of Hizbollah, brutally exploited as their human shields, and we deplore a war that was foisted upon Israel by Iranian design. Gaarder concludes: "Let not one Israeli child pay with his life," in the same column wherein he sets the scene for the extermination of all Israeli children. We will not oblige Gaarder and those he seeks to appease. Jewish sovereignty has returned to history. The wandering Jew is a figment of history, as Gaarder and his ilk are now history. We await the word of honest Norwegians who will vociferously condemn Gaarder because they realize that the fate of the Jews is an alarm bell for humanity. For further information, please contact Dr. Samuels at +33 6 09 77 01 58. Visit our new web site at http://www.wiesenthal-europe.com. Israel is now history. We no longer recognize the State of Israel. There is no way back. The State of Israel has raped the world's recognition and will not achieve peace until it lays down its arms. The State of Israel, in its present form is history, writes Jostein Gaarder. There's no turning back. It's time to learn a new lesson: We no longer recognize the State of Israel. We could not recognize the apartheid regime of South Africa, nor did we recognize the Afghani Taliban regime. Then there were many who did not recognize Saddam Hussein's Iraq or the Serbs' ethnic cleansing. We need to get used to the idea: The State of Israel, in its current form, is history. We don't believe in the notion of God's Chosen People. We laugh at this people's capriciousness and weep at its misdeeds. To act as God's Chosen People is not only stupid and arrogant, but a crime against humanity. We call it racism. There are limits to our patience, and there are limits to our tolerance. We do not believe in divine promises as a justification for occupation and apartheid. We have left the Middle Ages behind. We laugh uneasily at those who still believe that the god of flora, fauna and the galaxies has selected one people in particular as his favorite and given it silly, stone tablets, burning bushes and a license to kill. We call baby killers "baby killers" and will never accept that people such as these have a divine or historic mandate excusing their outrages. We just say: Shame on all apartheid, shame on ethnic cleansing and shame on every terrorist strike against civilians whether carried out by Hamas, the Hezbollah or the State of Israel! We acknowledge, and pay heed to, Europe's deep responsibility for the plight of the Jews, for the disgraceful harassment, the pogroms and the Holocaust. It was historically and morally necessary for the Jews to get their own home. However, the State of Israel, with its unscrupulous art of war and its disgusting weapons, has massacred its own legitimacy. It has systematically flaunted International Law, international conventions, and countless UN resolutions and can no longer expect protection from the same. It has carpet bombed the recognition of the world. But fear not! The Tribulation will soon be over. The State of Israel has seen its Soweto. We are now at the watershed. There's no turning back. The State of Israel has raped the recognition of the world and shall have no peace until it lays down its arms. May the spirit and the word blow the apartheid walls of Israel down. The State of Israel does not exist. It is now without defense, without skin. May the world therefore have mercy upon the civilian population; for our prophecies of doom are not aimed at the civilian individuals. We wish the people of Israel well, nothing but wellness, but we reserve the right to not eat Jaffa oranges as long as they are foul tasting and poisonous. It was endurable for some years to live without eating the blue grapes of apartheid. We don't believe that Israel grieves any more for the forty killed Lebanese children than it has wailed over the forty years spent in the desert three thousand years ago. We note that many Israelis celebrate such triumphs in the same manner they once cheered the plagues of the Lord as "fitting punishment" for the people of Egypt. (In that tale, the Lord God of Israel appears as an insatiable sadist.) We ask ourselves if most Israelis think that one Israeli life is worth more than the forty Palestinian or Lebanese lives. For we've seen pictures of little Israeli girls writing hateful greetings on the bombs about to be dropped on the civilian populations of Lebanon and Palestine. The little Israeli girls are not cute when they strut with glee at the death and torment on the other side of the fronts. We do not recognize the rhetoric of the State of Israel. We do not recognize the spiral of retribution and blood vengeance that comes with "an eye for an eye and a tooth for a tooth." We do not recognize the principle of ten or a thousand Arab eyes for one Israeli eye. We do not recognize collective punishment or population thinning out as a political weapon. Two thousand years have passed since a Jewish rabbi criticized the ancient doctrine of "an eye for an eye and a tooth for a tooth." He said: "Do unto others as you would have them do unto you." We do not recognize a state founded on anti-humanistic principles and on the ruins of an archaic national and warlike religion. Or, as Albert Schweitzer expressed it: "Humanitarianism consists of never sacrificing a human being for a cause." We do not recognize the old Kingdom of David as a model for the 21st century map of the Middle East. The Jewish rabbi claimed two thousand years ago that the Kingdom of God is not a martial restoration of the Kingdom of David; the Kingdom of God is within us and amongst us. The Kingdom of God is compassion and forgiveness. Two thousand years have passed since the Jewish rabbi disarmed and thoroughly humanized the old rhetoric of war. Even in his time, the first Zionist terrorists were operating. For two thousand years, we have rehearsed the syllabus of humanism, but Israel doesn't listen. It wasn't the Pharisee who helped the man who lay by the wayside, having fallen prey to robbers. It was a Samaritan; today we would say, a Palestinian. We are humans firstly - then Christian, Muslim, or Jew. Or as the Jewish rabbi said: "And if you greet your brethren only, what more do you do than others?" We do not accept the kidnapping of soldiers. But neither do we accept the deportation of whole populations or the abduction of legally elected parliamentarians and government ministers. We recognize the State of Israel of 1948, but not the one of 1967. It is the State of Israel that fails to recognize, respect or defer to the internationally lawful Israeli state of 1948. Israel wants more - more water and more villages. To obtain this there are those who want, with God's assistance, a final solution to the Palestinian problem. 'The Palestinians have so many other countries', certain Israeli politicians have argued; we have only one. The U.S. or the world? Or as the foremost protector of the State of Israel puts it: "May God continue to bless America." A little child took note of that. She turned to her mother, saying: "Why does the President always end his speeches with 'God bless America'? Why not, 'God bless the world'?" Then there was a Norwegian poet who let out this childlike sigh of the heart: "Why doth Humanity so slowly progress?" It was he who wrote so beautifully of the Jew and the Jewess. But he rejected the notion of God's Chosen People. He personally liked to call himself a Muslim. We do not recognize the State of Israel. Not today, not as of this writing, not in the hour of grief and wrath. If the entire Israeli nation should fall to its own devices and parts of the population has to flee their occupied areas into another Diaspora, then we say: May their surroundings stay calm and show them mercy. It is an eternal crime, without mitigating circumstances, to lay hand on refugees and a stateless people. Peace and free passage for the evacuating, civilian population no longer protected by a State. Shoot not at the fugitives! Take not aim at them! They are vulnerable now -- like snails without shells, vulnerable as slow caravans of the Palestinian and Lebanese refugees, defenseless as the women, children and elderly of Qana, Gaza, Sabra and Shatilla. Give the Israeli refugees shelter; give them milk and honey! Let not one Israeli child pay with his life. Far too many children and civilians have already been murdered. Vi ber om din hjelp til å støtte flere prosjekter.Vennligst bruk bankkonto nr. 6242.10.60644. A team from Ministry of guidance is in search of " reason to arrest" ! Pressure on press is intensified ! Pressure is intensified on press , it has been said that a team from Ministry of Guidance is on daily bases are reading " Sharq" , " Kargozaran" , "Etemade Melli", " Sarmayeh" and several other newspapers in order to find any cases to arrive to " reason to arrest" . There are rumors that according to this new plan by the authoritarian until the end of september fear will lead the country so that before the election , the ruling candidates won't have any problem in winning the election. Pressure on press and journalists once again have been intensified and closure of newspapers become an interest for the new government and finds herself in a situation that can bann any publication in whatever sizes. Closure of " Iran" newspaper was based on the publication of an offensive cartoon by the "council controlling press" but later because of the internal clashes between groups the court removed the bann on this newspaper but again with the complaint by press deputy in Ministry of Guidance the newspaper was put on hold for publication. The team from Ministry of Guidance have also charged Mr. lotfolah Meisami the manager in charge of " Cheshm Andaze Iran " publication and have ruled out for any consideration in punishment. Mr. Meisami is charged with " propaganda against the system" , publication of articles which will cause damage to the " foundation of the Islamic Republic" and also insult to police forces. The monthly literary publication " Karnameh " is also been banned . Ms. Negar Eskandarfar the manager in charge of the publication is charged with " publication of articles in "contrary to the public chastity" and contrary to ethic . She is sentenced to one year suspension sentences. The " Press controling Board " also gave a month time to " Sharq " newspaper to change its manager in charge . Any how , plan for limiting the press is increasing day by day and the " affectionate government" does not tolerate anyone . Answer - I haven't heared anything about the hunger strike of this prisoner, and it is not correct that we are keeping him in a special location but he is in Evin prison. Q- At present Akbar Ganji is in abroad and have spoked things against Iran, will there be a bill of indictment to arrest him when he returned to Iran ? A - We dont issue warrent of arrest or persecution here , leave this problem to those who have legal duties. A- Coroners office is a legal authority and carefully worked on this and does not follow anyone ..... we expect from the lawyers not to be passive on this and not to tampere the country's independence. Q- One reporter asked about the editor and cartoonist of " Iran Jomeh " newspaper , are they going to be released soon? A- These two individual have been arrested by the order of judiciary authorities and any decission making must be taken by judiciary and the judiciary power is seriousely following the file , in some crimes the temporary arrest goes to 2 months and in others to 4 months and this decission will stay but about these two person the court of revolution will soon take its decission. After 9 days of hunger strike in Evin prison Akbar Mohammadi was pronounced death and now Ahmad Batebi is on hunger strike , he is going to die if we stay silent! The lives of political prisoners in Iran is in great danger , save their lives ! Iran: Akbar Mohammadi's death in custody signals need for justice reformThe death in custody of Akbar Mohammadi, a 38-year-old former student, in the early hours of 31 July 2006 casts a pall over the entire Iranian justice system, Amnesty International said today. "The series of failures to afford Akbar Mohammadi justice have robbed him of his life and his family of human dignity. There can be no more deaths in Iranian custody. A thorough reform of the criminal justice system is urgently needed," added the organisation. "The Iranian authorities need to take urgent measures to ensure that political prisoners are afforded a fair and open trial; that torture and other ill-treatment in Iranian prisons is halted and that the practice of delaying or denying medical care is stopped immediately. "Amnesty International is alarmed at reports indicating that following an inspection of Akbar Mohammadi’s detention conditions by senior officials he was administered a drug which may have resulted not only in his tranquillisation but possibly, as a result of a complication, his death.From around 21 July, Akbar Mohammadi had reportedly undertaken a hunger strike, the last three days of which he refused liquids as well as solids.Amidst reports that an autopsy has been carried out domestically by the coroner (pezeshk-e qanouni), Amnesty International considers that there needs to be an independent investigation and autopsy by fully independent pathologists to determine the cause of Akbar Mohammadi’s death and the conditions that facilitated it. Principle 9 of the UN Principles on the Effective Prevention and Investigation of extra-Legal, Arbitrary and Summary Executions states: "There shall be thorough, prompt and impartial investigation of all suspected cases of extra-legal, arbitrary and summary executions, including cases where complaints by relatives or other reliable reports suggest unnatural death in the above circumstances. […] The purpose of the investigation shall be to determine the cause, manner and time of death, the person responsible, and any pattern or practice which may have brought about that death. It shall include an adequate autopsy, collection and analysis of all physical and documentary evidence and statements from witnesses. 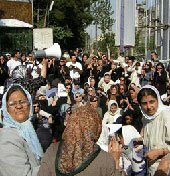 "Amnesty International also expressed concern that political prisoners Heshmatollah Tabarzadi, Ahmad Batebi and Akbar Mohammadi’s brother Manuchehr are facing heightened risk following this latest death in custody.BackgroundAkbar Mohammadi was one of the thousands of students arrested in July 1999 after student demonstrations which erupted following the closure of newspapers and one of the periodic clampdowns on freedom of expression that occurred throughout the late 1990s in Iran. Akbar Mohammadi and other students were sentenced to death in September 1999 following a manifestly unfair trial. He was brutally tortured while in incommunicado detention, denied the right of legal representation and access to family. Following domestic and international outcry, in November 1999 the sentences were commuted to 15 years’ imprisonment.From the day of his arrest, Akbar Mohammadi was routinely tortured. While in the custody of the Ministry of Intelligence, he was allegedly suspended by his arms, and violently beaten. Guards beat him to the edge of consciousness, telling him that all he had to do was blink to accept the charges against him.The information available strongly indicates that the repeated delays or outright denials of adequate medical care by Iran’s judicial and prison authorities have contributed to his death in custody. At the end of November 2003, for example, judicial authorities permitted his hospitalisation in response to urgent stomach and kidney problems, internal bleeding and possibly a lung infection. Despite medical advice that he be hospitalised for one month, he was returned to Evin Prison one week later.Between July 2004 and June 2006, Akbar Mohammadi resided at his family home in Amol, northern Iran, where he received medical treatment and wrote a prison memoir. He was re-arrested on 11 June 2006 and returned to Evin prison where, once again, he was denied the right to meet with his family. Following one visit by his lawyer, Akbar Mohammadi was said to be in ill health and suffering from acute abdominal pain. Prison medical staff reportedly advised that he should be removed from prison for medical treatment.According to sources inside Evin prison, he sought medical care from around 26 July during his hunger strike but he was chastised by medical officials who rejected his request. Between 26 and 29 July, he was reportedly provided unspecified treatment, though an Iranian parliamentary delegation visiting Evin prison was denied permission to visit the section of the prison -- possibly the clinic itself -- in which he was held. On or around 29-30 July he was reportedly gagged and bound to a bed while senior officials visited the prison. The Chief Prosecutor for the province of Tehran, Said Mortazavi, and two senior prison officials, along with a prison guard reportedly inspected him on 30 July, during which time he was administered an unspecified ‘medicine’. His condition reportedly worsened in the course of that day and he died on 31 July. Despite the call by his lawyer that his body be examined by an independent team of pathologists, his body was transferred to a coroner on 31 July. Akbar Mohammadi’s parents arrived at Imam Khomeini Airport in Tehran on Tuesday 1 August 2006, at 02:30 local time, from a visit outside the country. They were forcibly taken directly from the aircraft to awaiting vehicles and driven directly to their house in Amol, northern Iran. They were denied permission to see the body of their deceased son, as was his brother Manuchehr, who remains in Evin prison. At the time of writing, there are reports that the body of Akbar Mohammadi has been buried. photo essay on Ganji in Berkeley. I think this is a very attractive method for story telling. Sorry these last few weeks i was busy of moving to a new location . Hate moving . Shirin Ebadi warnned there is possibility the lawyers defending human rights in Iran be arrested ! Mr. Ahmad Batebi on his 12th days of hunger strike in Evin prison! Ahmad Batebi's wife Ms. Samieh Beyenat sent a letter to UN human rights councile asking to send a team of observer to visit her husband in the Evin prison and to monitor his situation . Mr. Naser Zarafshan a prominent lawyer , lawyer of Zahra Kazemi's case , lawyer for chain murdering victimes and a co- founder of Centre for Human Rights Defenders on his 5th years in prison! A few days later, the request of Khalil Bahramian, Mohammadi's lawyer to see his client was turned down by prison officials because they said he was on a hunger strike. Bahramian told the press the same day that his client’s rights were denied to him and that despite being in prison for over six years, he had only been allowed to visit his family once. Akbar Mohammadi was arrested in 1999 during the student uprising and suffered injuries caused by torture. He had been received three surgeries in connection with his injured back. He was given a 2 year leave from prison to avoid outcomes such as those of Zahra Kazemi who died in prison. When Ahmadinejad won the presidency last year, Akbar was recalled back to prison. According to his cell mates, on the sixth day of his hunger strike, he lost consciousness and his cellmates took him to the prison clinic. The letter was signed by these cellmates: Heshmatollah Tabarzadi, Manoutchehr Mohammadi, Ahmad Batebi, Behruz Javid Tehrani, Mohammad-Reza Khansari, Mehrdad Lohrasbi, Arjang Davoudi, Khaled Hardani, Amir Heshmat Saran, Valiollah Feizmahdavi, Assad Shagagi, Khalil Shalchi, Afshin Ba-Imani, Siamak Pourzand, Hashem Shahinnia, Shahin Aryanejad, Shahram Pourmansouri, Jafar Aghdami, Mohammadreza Rajabi, Heydargholi Soltani, Mohammad Nikbakht, Naser Kheyrollahi, Ebrahim Momeni. His lawyer Bahramian says he is preparing charges against officials who returned Mohammadi to prison from his leave. He questions the motives of prison officials for transferring Akbar to his prison cell after he had a minor stroke in the bath room. He says, "His second stroke killed him since he had been subjected to the worst psychological tortures, which finally killed him, or in my view they killed him. From what I have heard, he was put under pressure even when he was taken to the prison clinic where his mouth was taped to prevent him from expressing his protests.” When Mohammadi was on leave, “doctors had said that he should not be returned to prison because of the seriousness of his health conditions, but still somebody had ordered him to return, which is the cause of his death. Whoever made that decision must be charged with the consequences of his act,” Bahramian said. But does he believe this charge and suit will bring about anything? “I have to pursue my duty. With full force. I fight for the rights of people. But the changes of success are little. The people of Iran must see the results. They must act to prevent such destruction. Especially as Manoutcher Mohammadi’s condition is very critica too,l he is on the verge of dying. I am returned from a meeting that I just had with him. He is in really bad condition. He will either go insane or he will have a heart attack. I had issued warnings to the prison director and the deputy prosecutor on this. I have told them that Manoutchehr Mohammadi is next in line, unless they change their ways. Then it will be Ahmad Batebi’s turn who is also in bad medical shape. I think there is a plan to get rid of all of these kids,” Bahramian warned. But does the same fate to which Akbar was subjected await Manoutchehr Mohammadi, Batebi and other prisoners? His last words were that he holds the leadership of Iran’s government responsible for whatever happens to him, who must respond. The elections at the third general assembly of Association of Iranian Journalists (the only overall Iranian syndicate of journalism) were held at Hosseinieh Ershad in Tehran and a new management was brought in. Through these elections, a group of new independent and reformist journalists got into the association leadership. 467 individuals has singed up as candidates for management posts of the association out of which Badr al-Saddat Mofidi, Ahmad Zeidabadi, Mashaallah Shamsolvaezin, Karim Arghandpour, Rajabali Mazrui, Abolhassan Mokhtabad and Arash Hassan-nia were elected as the principal officers of the board of directors. Following the elections, Fars news agency that is affiliated to Iran’s judiciary, published a report about the elections at the “Association of Muslim Journalists” (affiliated to the hardliners), indicating its unhappiness with Association of Iranian Journalists. Elections to this professional organization take place once every three years. This is the first organization that was created during the reform years of Mohammad Khatami, who personally inaugurated the group in 1997. It has been recognized internationally by professional organizations, such as IFJ, the ILO, and the UN, as the only press association in Iran. During its entire life, reformists and independent journalists have received the largest number of votes to elect its officers. But unlike previous years, this year hardliners have been trying hard to change this picture and those of other professional associations. So it appears that he Ministry of Labor of Iran now has no choice but to recognize the new members of the guild. Officials of the guild have said that if they run into problems they are going to the Administrative Court. By rejecting the results of the recent elections of journalists, the ministry of labor now faces many other organizations which have a similar fate as that of Association of Iranian Journalists. Ahmad Batebi on his ninth day of hunger strike in Evin prison ! Father and mother of Akbar Mohammadi needs your help! Summary of the condition of Akbar Mohammadi's lifeless body! His eyes and mouth were open, his forehead was swolen and his teeth were out of his mouth, his scall was broken and from bellow the throat upto the stomach was swen . Shoulder and arm , back , upper shoulder and sole were dark blue , his stomach was saged and his ribs were pointed outward and during washing the body from the back of the head and inside the ear blood were gushing out which we stoped it by puting cotton in it, his fingers were bended , around the bending on his hand and feet were dark blue and there was a dark blue line around his eyes, his weight before hunger strike was 95kg and was reduced to 45kg , me and my wife together with our relatives and friends have saw the lifeless body of Akbar Mohammadi before burial as it is mentioned on the above lines , the body diden't look like Akbar's and it seemed that before delivery to " Amol" make- up was used ( to show less torture on him) , the body was in a situation that when his other uncle Mr. Ashrafpour was allowed to see the doctor from coroner's office sent the agents from the ministry of information out and told his uncle that you can complain without any fear and worries, at the end we would like to ask from all organizations and human rights group to demand for the exhumation and autopsy of the body for detemining the cause of the death. Under sigend are the relative and friends who have seen the body and approve the above mentioned evidents. When a newspaper becomes the voice of ministry of information! "Kayhan": ban the internet ! "Kayhan" is a right wing and goverment newspaper in Iran , pro regime and pro ministry of information. It has been said that infact it is a safe heaven for ministries agents.I'm writing this because these people call themselves journalists and yet call the ministry of justice to filter the internet in Iran.Kayhan is fully under the control of Mr. Hosein Shriatmadari , he had a very close tie with Said Emami the master mind in the ministry of information who was behind the killing of political dissidents and writers in Iran which later become known as " The chain murdering " , Said Emami later died suspiciousely by commiting suicide when Akbar Ganji the investigative journalist started writinghis articles in reformists newspaper of the time . Mr. Shariatmadari is also a close friend and buddy with Said Mortazavi the public prosecutor of Tehran and " butcher of independent media " and a suspect and interrogator of Canadian-Iranian photojournalist Zahra Kazemi. According to "Roozonline" Kayhan usually reports about political prisoners and the regime's critics call this newspaper as " the interrogators paper " . When somone is arrested for political or critical reason this newspaper writes an article and it talks from "an informed source" that for example Mr. Jahanbegloo who is currently in detension because of activities against Islamic Republic has confessed that he was working on a wide network called " the web" for collecting classified information from groups and political, cultural,social and economical activists. The "informed source " of Kayhan has added that : Mr. Ramin Jahanbegloo has confessed that he was trying to plan for a "cyber spy net" namely C.E.S in Iran and a group of cybernetics, active Iranian internet runners in Yahoo, Google and the managers of some site that are filtered were organized by him to do this project . Roozonline writes :"Kayhan newspaper in previous years have wrote articles about the so called confession of Siamak Pourzand, Abbas Abdi , Abdolfatah Soltani and Faraj Sarkouhi ". So Kayhan is a " Scenario making paper ". Kayhan is definitely embeded with foundamentalists, conservatives and with ministry of information. Activities under the name of "Centre for Human Rights Defenders " is illegal and the violators will be prosecuted ! The secretariate commission on article 10 ( By-Law on activities of parties and associations ) in a communique stated that the activities of some people under the name of "Centre for Human Rights Defenders" is illegal . According to the report by "ILNA" in speaking on public relation from Ministry of Interior the communique reads as follow : " since some people under the name of Centre for Human Rights Defenders have activities such as writng statement and communique , media gathering, gathering for protest, letter writing to officials and organizations in and outside the country , through this communique we inform that up to now the mission and constitution of the above Centre haven't been approved by the commission on article 10 , therefore any kind of activities under the name of Centre for Human Rights Defenders is and will be illegal and the violators will be legaly prosecuted . Madame Shirin Ebadi the Noble Peace Prize winer is the current president and co-founder of the Centre and other co-founders and members are mostly lawyers. Iran: Akbar Mohammadi's death in custody signals need for justice reformThe death in custody of Akbar Mohammadi, a 38-year-old former student, in the early hours of 31 July 2006 casts a pall over the entire Iranian justice system, Amnesty International said today. “The series of failures to afford Akbar Mohammadi justice have robbed him of his life and his family of human dignity. There can be no more deaths in Iranian custody. A thorough reform of the criminal justice system is urgently needed,” added the organisation.“The Iranian authorities need to take urgent measures to ensure that political prisoners are afforded a fair and open trial; that torture and other ill-treatment in Iranian prisons is halted and that the practice of delaying or denying medica l care is stopped immediately.”Amnesty International is alarmed at reports indicating that following an inspection of Akbar Mohammadi’s detention conditions by senior officials he was administered a drug which may have resulted not only in his tranquillisation but possibly, as a result of a complication, his death.From around 21 July, Akbar Mohammadi had reportedly undertaken a hunger strike, the last three days of which he refused liquids as well as solids.Amidst reports that an autopsy has been carried out domestically by the coroner (pezeshk-e qanouni), Amnesty International considers that there needs to be an independent investigation and autopsy by fully independent pathologists to determine the cause of Akbar Mohammadi’s death and the conditions that facilitated it. Principle 9 of the UN Principles on the Effective Prevention and Investigation of extra-Legal, Arbitrary and Summary Executions states: “There shall be thorough, prompt and impartial investigation of all suspected cases of extra-legal, arbitrary and summary executions, including cases where complaints by relatives or other reliable reports suggest unnatural death in the above circumstances. […] The purpose of the investigation shall be to determine the cause, manner and time of death, the person responsible, and any pattern or practice which may have brought about that death. It shall include an adequate autopsy, collection and analysis of all physical and documentary evidence and statements from witnesses.”Amnesty International also expressed concern that political prisoners Heshmatollah Tabarzadi, Ahmad Batebi and Akbar Mohammadi’s brother Manuchehr are facing heightened risk following this latest death in custody. Akbar Mohammadi was one of the thousands of students arrested in July 1999 after student demonstrations which erupted following the closure of newspapers and one of the periodic clampdowns on freedom of expression that occurred throughout the late 1990s in Iran. Akbar Mohammadi and other students were sentenced to death in September 1999 following a manifestly unfair trial. He was brutally tortured while in incommunicado detention, denied the right of legal representation and access to family. Following domestic and international outcry, in November 1999 the sentences were commuted to 15 years’ imprisonment.From the day of his arrest, Akbar Mohammadi was routinely tortured. While in the custody of the Ministry of Intelligence, he was allegedly suspended by his arms, and violently beaten. Guards beat him to the edge of consciousness, telling him that all he had to do was blink to accept the charges against him.The information available strongly indicates that the repeated delays or outright denials of adequate medical care by Iran’s judicial and prison authorities have contributed to his death in custody. At the end of November 2003, for example, judicial authorities permitted his hospitalisation in response to urgent stomach and kidney problems, internal bleeding and possibly a lung infection. Despite medical advice that he be hospitalised for one month, he was returned to Evin Prison one week later.Between July 2004 and June 2006, Akbar Mohammadi resided at his family home in Amol, northern Iran, where he received medical treatment and wrote a prison memoir. He was re-arrested on 11 June 2006 and returned to Evin prison where, once again, he was denied the right to meet with his family. Following one visit by his lawyer, Akbar Mohammadi was said to be in ill health and suffering from acute abdominal pain. Prison medical staff reportedly advised that he should be removed from prison for medical treatment.According to sources inside Evin prison, he sought medical care from around 26 July during his hunger strike but he was chastised by medical officials who rejected his request. Between 26 and 29 July, he was reportedly provided unspecified treatment, though an Iranian parliamentary delegation visiting Evin prison was denied permission to visit the section of the prison -- possibly the clinic itself -- in which he was held. On or around 29-30 July he was reportedly gagged and bound to a bed while senior officials visited the prison. The Chief Prosecutor for the province of Tehran, Said Mortazavi, and two senior prison officials, along with a prison guard reportedly inspected him on 30 July, during which time he was administered an unspecified ‘medicine’. His condition reportedly worsened in the course of that day and he died on 31 July. Despite the call by his lawyer that his body be examined by an independent team of pathologists, his body was transferred to a coroner on 31 July. Akbar Mohammadi’s parents arrived at Imam Khomeini Airport in Tehran on Tuesday 1 August 2006, at 02:30 local time, from a visit outside the country. They were forcibly taken directly from the aircraft to awaiting vehicles and driven directly to their house in Amol, northern Iran.. They were denied permission to see the body of their deceased son, as was his brother Manuchehr, who remains in Evin prison. At the time of writing, there are reports that the body of Akbar Mohammadi has been buried. surrounded with military and security forces , the autopcy body of Akbar Mohammadi the imprisoned student of the 1999 students movement was buried in " Deh Changeh" a village in northern province of Iran.His body was buried contrary to the agreement of his parents. His parents are suspicious to his death and were trying to ask non-partial doctors to examine the body with the presence of international organizations but the ministry of information transfered the body hastily at night to the city of " Amol " in order to prevent public protest and prevented the parents to take any action. At 2:30am Tuesday morning August 1 /06 , more than 200 mourners with black and red shirts gathered at "Mehrabad Airport" to express their condolences to Akbar's parent who were coming from Turkey to Tehran , they were visiting their daughter at the time of Akbar's death in Evin prison, but after landing the security officials directed the parent of Akbar Mohammadi to exit from another door in the air port .and a few hours later it was announced that the parent of Akbar Mohammadi were transfere to their birth place the city of " Amol". Despite of this announcement the mourners with flower branches in their hands and holding Akbar Mohammadi's picture chanted the song " Ay Iran" . Akbar Mohammadi's brother whos name is Manuchehre Mohammadi who is also in Evin prison in a telephone conversation to this reporter said that i asked the prison authority to allow me to be with my brother and they gave me four days to mourn with my family but under heavy security forces.On Fiday August 4 / 06 a memorial will take place in families home and Manuchehr Mohammadi asked the public to join them. His chest was hot , he was saying that his heart is painful , give me a cold thing i'll put on my chest, he needed ice, it wasen't good for him we diden't give , we brought bottles of cold water , he put it under his shirt on his heart, after a few miuites the first bottle became warm , then we put the second cold bottle on his heart, we were massaging his feet , we massaged his left foot for 20 minuites, his feet were like an stick , wasen't moving , there was no water in his body,his lips were dry, was cracked , there was no light on his eyes , he couldent see well, we told him to stop his hunger strike , you are killing yourself, he said the regime must know that we are human not dog, he was very angry from the officials in the clinic, they haven't done anything for him, his health was worsening moment by moment, he coulden't see , he was breathing hardly, all of a sudden he shouted, all of the cell mate came , he was pale , his muscles were frozen, his breath was numbered, we brought him up, and we put stretcher on the ground , he took his last breath, No paulse , we cried, he was gone. From cell # 350 to clinic five of us were holding the stretcher, we reached by running to the clinic,we put him on the ground , his eyes were open, he was looking at us quietly , we knew that he is gone, but his eyes were much to say to us, a few moments later doctors came , we told doctor Akbar is gone and the Doc massaged his heart, another nurse came , and put the oxygen bag on his nouse and mouth, ... a few moments later they send us out of clinic and closed the doors, they called the prison official and we walked toward the cell while crying , Akbar has gone, we have lost Akbar,we coulden't believe. While world attention is on war in the Middle East, the regime in Iran is murdring innocent political prisoners, ! In the front line are the students who are currently in Evin prison ! Mr. Batebi is on his third day of hunger strike in cell 209 of Evin prison .Witnesses saw him in Evin prison's clinic. His health situation is very bad . His wife have said : From the day of his arrest he went on hunger strike. He is on hunger strike while a few days before he was hospitalized for breathing , kidney and stomach bleeding problems.Now that Mr. Akbar Mohammadi is dead in Evin prison it is to say that the danger is threatening Mr. Batebi and all political prisoners life. Fate of prisoners such as Manouchehr Mohammadi and Ahmad Batebi are in serious danger. Akbar Mohammadi, lead accused of 1998 students unrest file died in Evin prison cell. He passed away while he had warned of such tragedy in his letter four days ago. Students Committee of Human Rights Reporters wrote that in his 9th day of hunger strike, Mohammadi died of a heart stroke in Evin bathroom. He wrote: "I have been in prison for 7 years and have gone through tremendous physical and psychological pressures. I am inflicted to different illnesses including back pain that was imposed on under stone-aged different sorts of tortures during the preliminary interrogations. As a result of my severe back problem, prison security agents sent me to a so-called indefinite leave from prison. They were too nervous that the illness may paralyze or kill me and thus its consequences create problems for them. Specialists that I visited during my sick leave prison Evin recommended that I should be treated outside the country since my spinal cord was entirely damaged therefore I went through the pain and took drugs. Finding out that I was still alive, they recalled me to prison. Since my last month's return, my frequent calls to prison clinic have remained ineffective. Ignoring, swearing and insulting had been my only response for medical treatment. Since the authorities are preparing to humiliate and kill me, I have decided to reject their oppressive methods and die dignified and proudly make my destiny. Under the condition that the authorities do not respond to my legal demands, I will go on indefinite hunger strike to call for my release and protest systematic violation of human rights by Islamic Republic government as well as for release of all political prisoners in Iran. It is needless to mention that heads of the government are directly accountable for my fate and should take responsibility." A few days after, Khalil Bahramian, Mohammadi's lawyer was banned from visiting his client. He was told that he is banned from any visit since he is on hunger strike. The same day, Bahramian criticized violation of his client's legal rights and has been denied taking leave from prison in the past six years. Akbar Mohammadi's cellmates in notorious Evin said that in his fourth day of hunger strike, his physical condition had been severely deteriorating. And finally Akbar Mohammadi's frail body lost consciousness in cell 350 in Evin and was transferred to prison clinic. Evin in clinic, he was not treated. Prison security agents confronted Akbra Mohammadi with his imprisoned brother Manouchehr to persuade him to break his hunger strike but he insisted on his demands. "Seven years ago, Akbar Mohammadi was arrested in students' unrest in summer of 1998. Severe torutures Towhid Prison inflicted severe illnesses to his body and he went under operations three times. Fearing of his deteriorating situation and his life, the judicial and security officials that did not need a Zahra Kazemi murder case sent him to indefinite leave but he was sent back to Evin when the hard-line government came to power. We are all concerned about his failing situation and invite the entire local and international defender of human rights to rise to defend Akbar Mohammadi." The letter was signed by Heshmatollah Tabarzadi, Manouchehr Mohammadi, Ahmad Batebi, Behruz Javid Tehrani, MohammadReza Khansari, Mehrdad Lohrasbi, Arjang Davoudi, Khaled Hardani, Amir Heshmat Saran, Valiallah Feizmahdavi, Khalil Shalchi, Afshin BaImani, Siamak Pourzand, Hashem Shahinnia, Shahin Aryanejad, Shahram Pourmansouri, Jafar Aghdami, Mohammadreza Rajabi, Heydargholi Soltani, Mohammad Nikbakht, Naser Kheyrollahi, Ebrahim Momeni. Bahramian questions the motives of prison officials that transfered him to his cell while he had a minor stroke in the bathroom? He says: "His second stroke kills him since he had gone under worst psychological tortures and he died or in my view he was killed. the officials had chained him in Evin clinic and taped his mouth to silence him." He says that Manouchehr Mohammadi is also in a very concerning situation and his life is under threat and he may die any moment. He said that he has met with him and is in a very bad shape; he will either go insane or will have a heart stroke. Mohammadi's lawyer added that he has warned deputy prosecutor and head of Evin. If the situation continues like this, Manoucher and Ahmad Batebi will both die. It seems that there are hands that are considering physical elimination of these student activists. Suspicious death of Akbar Mohammadi ! The body of Akbar Mohammadi who have died suspiciousely on Sunday night after nine days of hunger strike in Evin prison where Zahra Kazemi was murdered , has been examined by coroners office for autopsy but the coroners office have announced that the result of the autopsy and the reason for his death will be available in a month. They haven't said why they need a month for the reasult of the autopsy? This is unacceptable and looks unusual , while the result of Zahra Kazemi's autopsy was ready in an hour and two days later public was informed about the reason for her death. Is judiciary power trying to prevent itself from another infamy like the case of Zahra Kazemi and are they trying to cover up the fact about the suspicious death of Akbar Mohammadi? According to Akbar Mohammadi's lawyer and based on medical doctors he shoulden't have been in the prison in the first place because of his health situation, thats why they have given him unlimited time to be outside the prison , but the public prosecutor office arrested him and brought him back to prison and at the time of arrest they diden't allow him to bring with him his medications. With this kind of situation he started his hunger strike , Why the officials in judiciary prevented him to take his medication and why the ministry of justice afraid to announce the reason behind his death ? In another news the "Association of Human Rights Defenders" in Iran in a statement announced that the death of Akbar Mohammadi is suspicious!